How many people use salt on their food? My husband, Mike, and I were just at the movies and enjoying a nice big box of popcorn. Although I thought there was the perfect amount of salt already on it, I noticed that Mike continued to put more on. So it got me thinking about how we use salt and how many different forms of salt there are. We live in an age now where, like everything else, salt is not a bad thing in moderation, but it's not the first thing you should grab on the table, we’re told. If you do use it, which kind? Regular, Kosher, popcorn, smoked, Himalayan or Hawaiian Red salt (just to name a few of which I found in my cabinet)? I have to give Mike credit because I've never been that curious to use different kinds of salt, but he has (thus all the different kinds in the cabinet). Through his purchasing of these different salts I have then been trying to test them out -- that is, if I remember to pull the salt out of the cabinet. My personal favorite is to use smoked salt on hot brown rice with just a hair of real hand-churned butter (my favorite find over the summer); and let me tell you what, it is the bomb of flavors in your mouth, it is so good! But I'm curious, how exactly do you use these different salts besides the obvious of course? I'm interested in knowing: how many of you have used some of these salts in your homes? If you have any ideas for me, send them to my email (debgreatheart@aol.com) so I can try some new recipes. The other newest curiosity -- and biggest thing I didn't know about -- is the new adventure people are having with grilling with salt plates. Yep, you're reading that right: salt plates. Personally I think they’re absolutely beautiful. I would never put them on the grill; I would use them instead for display in my house, but you would only understand this comment if you saw my house. The salt plate is something Mike received as a gift, as he does do a lot of grilling. I will have to let you know how that turns out. I have a recipe here that uses the Hawaiian red salt (it is from a company that specializes in olive oil and vinegar and also sells Hawaiian red sea salt). If you're a person that also enjoys lamb, this recipe will be right up your alley. Enjoy! In a glass casserole dish, stir in your balsamic vinegar, garlic, salt and pepper. Add lamb chops and roll them around so that they are well covered with balsamic. Cover with plastic and refrigerate for several hours. When you are ready to cook, remove the marinating chops and discard the marinade. In a hot skillet, add olive oil and sear the chops for 2-3 minutes per side, depending upon your desired temperature. 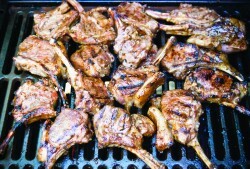 Find a great Pure Mountain side dish to serve go with these marvelous lamb chops.